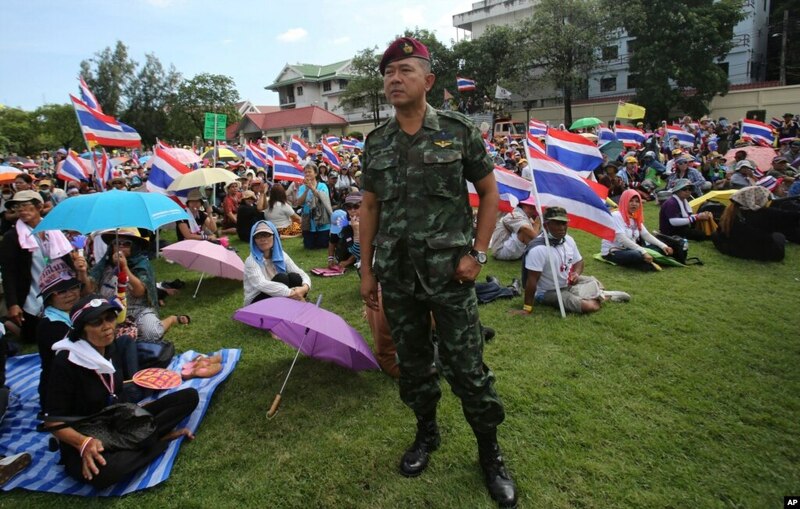 April 19, 2015 -- Links International Journal of Socialist Renewal -- Thailand's military junta’s new draft constitution is a pathetic, backward, anti-democratic and infantile document. Just like the rantings of generalissimo Prayut Chan-ocha (pictured above), it is full of tub-thumping and shouting about the “duties” and “responsibilities” of Thai people to grovel to “Nation, Religion and King”. It is infantile in this because it is written by conservative idiots who think that by bullying the population into conforming to elite beliefs they can actually change peoples’ attitudes. The infantilism gets worse when we get to part 2 of the constitution, which is headed; “Good Political Leaders and Good Representatives”. It doesn’t take much brain power to guess what the junta’s definition of “good” might be. High up on the list is loyalty to “Nation, Religion and King” and not being corrupt … blah blah blah. The whole thing sounds like some moral tale designed for a bad kindergarten. Yingluck Shinawatra leaves the final impeachment hearing at parliament in Bangkok. Photograph: Vichan Poti/Demotix/Corbis. January 28, 2015 -- Links International Journal of Socialist Renewal -- Let us be clear. The impeachment motion passed by the puppet parliament on January 23 against former Thailand's Prime Minister Yingluck Shinawatra, submitted to the military junta’s appointed Assembly by the National Anti-Corruption Commission, over her role in the rice price support scheme for farmers, is a total farce and a red herring. It is a deliberate part of the anti-reforms designed to destroy democracy. It has nothing to do with the rice scheme. Yingluck is accused of “allowing corruption to take place” in this rice scheme and of presiding over financial losses to the government. December 5, 2014 -- Links International Journal of Socialist Renewal -- As far as the Thai ruling class is concerned, the official religion of the country, which they are forever trying to ram down our throats, is not Buddhism but “Monarchy”. For historical and philosophical reasons Buddhism has not been the main authoritarian tool of the Thai ruling class. Kings and military dictators were always wary of building up rivals if they promoted the power of the monks. Since the late 1950s the military sought to control the monks and make sure that they were mainly apolitical. This is unlike in Burma or Laos, where the Buddhist monks were politicised by the nationalist movements. Thai Buddhism is also a religion based on the actions of private individuals who try to amass merit. 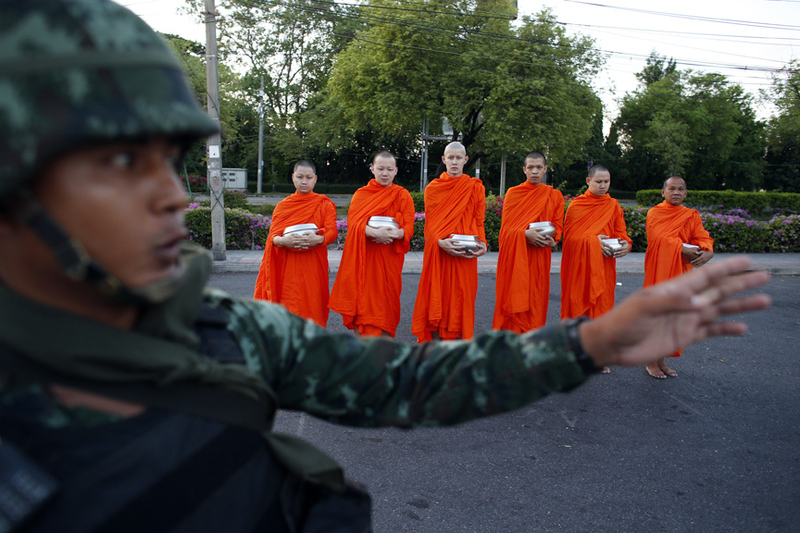 Thai monks do not usually give public sermons in order to control the beliefs of the population. Buddhism is also practiced in a manner which is strongly laced with animistic beliefs in spirits and ancient superstitions or it is mixed with Hinduism. 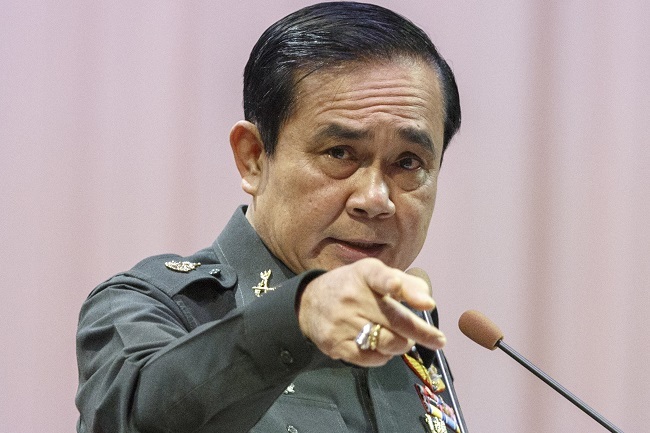 October 18, 2014 -- Links International Journal of Socialist Renewal -- While the dictator Prayut (or Prayuth) Chan-ocha (pictured above) was huddled with the Chinese and Japanese representatives in Italy, he had previously told reporters not to “speculate” when elections would be held again in Thailand. Many analysts are predicting that elections will not take place at least until 2016, thus rubbishing the initial promises of the junta to hold elections next year. Meanwhile a panel of anti-reformist junta lackeys were pontificating about the legacy of the 14th October 1973 uprising against the military and how this would “influence” the present anti-reform process. This academic meeting was not banned by the junta, unlike pro-democracy seminars. August 21, 2014 -- Ugly Truth Thailand -- The self-appointment of dictator of Thailand, Prayut Chan-ocha, as prime minister, by his hand-picked military parliament, was an unsurprising non-event. Prayut did not even bother to attend and the so-called “vote” was unanimous. Prayut’s junta is both brutal and stupid. It is brutal in its crackdown on pro-democracy activists, the use of lèse-majesté to jail its opponents, and the use of violence against detainees. It is stupid in its attempts to create an image that the coup has created “peace and happiness” among citizens. Prayut also loves to strut around barking orders in a pathetic quest to appear like some outdated “strongman”. A Thai journalist protests next to troops over concerns about freedom of speech. Photo by @redbamboo16 on Twitter. June 29, 2014 -- Links International Journal of Socialist Renewal -- As the autocratic rule of Big Brother Generalissimo Prayut Chan-ocha trundles forward, we are seeing the militarisation of politics, economics and society. All government ministries are controlled by military personnel. Civil servants who were in post before the coup are being replaced by those who are loyal lapdogs or cronies of the junta. New executive board members have been appointed to state enterprises, with military men on every board and with Generalissimo Prayut as overall chair. Civilian cronies are carefully chosen from among the ranks of the whistle-blowing middle class mobs who hate democracy. 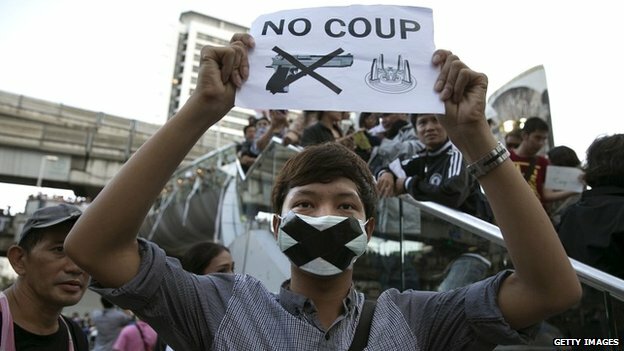 May 26, 2014 -- Links International Journal of Socialist Renewal -- The most striking thing about the latest coup d'etat in Thailand is the speed and size of the anti-coup protests. For the last three days, immediately following the coup, mass protests of ordinary people have simultaneously erupted in many areas of Bangkok but also in Chiangmai and other towns. This is history in the making. May 20, 2014 -- Links International Journal of Socialist Renewal -- Today Thai army general Prayut Chanocha declared martial law without consulting the caretaker government or any other elected representatives. Troops took over all radio and TV stations and are positioned along major road intersections in Bangkok. Despite the fact that he claimed that “this is not a coup”, Prayut’s actions smell, taste and look like a coup. This is from a man who has blood on his hands. Four years ago to the day Prayut oversaw the shooting down in the streets of almost 90 Red Shirt pro-democracy demonstrators. Before the elections in the following year he made public statements against the Pheu Thai Party. He had previously been a key figure in manoeuvring the (anti-)Democrat Party into an unelected government in 2008. He has never been brought to court for his crimes and was on the list of those who would be given total amnesty in Yingluck Shinawatra’s abortive amnesty bill. 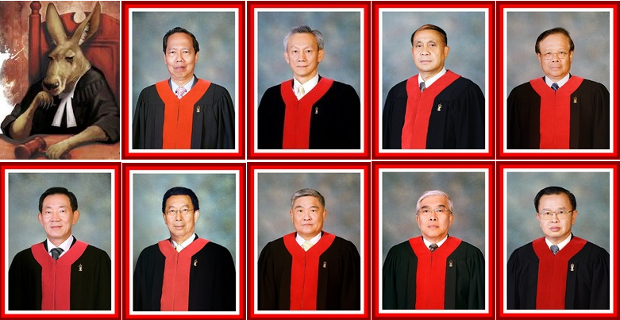 May 8, 2014 -- Links International Journal of Socialist Renewal -- The unelected, anti-democratic and illegitimate Constitutional Court has staged a coup d'état, overthrowing Prime Minister Yingluk Shinawatra on a mere technicality. It claims that the elected prime minister did not have the right to move a government official. It is a mere technicality because she is accused of “abusing her power” to appoint an in-law to the vacant position. While Yingluk has been accused of this ridiculous “wrong doing”, the military coup makers and the Democrat Party politicians who killed scores of pro-democracy demonstrators enjoy impunity. The actions of this court would be laughable if they were not so serious. The court has previously ruled against the right of an elected parliament to amend the military constitution so that all senators would be elected. It also ruled that the government cannot build a much-needed high-speed rail link. In that case the old fogies stated that “it would be better to build roads”. Apparently they have illusions that they are experts in all matters and have the right to run the country instead of the government. Anti-democratic thugs opened fire on those wanting to vote. February 3, 2014 -- Ugly Truth Thailand -- The February 2 general election cannot solve the Thai political crisis because those lined up against the government and the holding of democratic elections are fundamentally opposed to democracy. Anti-democratic protesters attempt to disrupt pre-poll voting, January 26, 2013. January 27, 2014 -- Links International Journal of Socialist Renewal -- On January 26, the Democrat Party’s mad dogs unleashed violence around Bangkok’s voting stations. Voting stations throughout the country were supposed to be open for people to cast their votes in advance on the February 2 general election. Advanced voting is a required service since it is compulsory for people to cast their ballot. 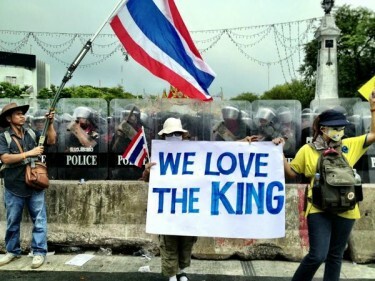 In many areas of Bangkok, angry residents argued with the anti-democratic protesters. They also protested against local election commissioners who closed voting stations whether or not they were surrounded by Sutep Tuaksuban’s Democrat Party thugs. At some stations the thugs physically attacked citizens who wanted to vote. What happened on the day shows that significant sections of the Bangkok population are opposed to the Democrat Party’s attempts to wreck the election. This will only come as a surprise to those commentators who claim that the Thai crisis is a “rural vs Bangkok” dispute. At the last election almost half of the Bangkok electorate voted for Pheu Thai. December 21, 2013 -- Links International Journal of Socialist Renewal -- Prime Minister Yingluck Shinawatra and her Pheu Thai government were pressurised into dissolving parliament by a nasty coalition of Sutep Tuaksuban’s Democrat Party, middle-class protesters, pro-military academics, conservative civil servants and NGO groups. This is the same coalition that supported the 2006 military coup. Having now tasted blood, they want more. They are demanding that Yingluck resigns her position as caretaker prime minster, a role stipulated by the constitution. They want the election to be boycotted by opposition parties. They also want to postpone the general election, which is due in early February. They are justifying this by their dishonest claim to want to “reform” Thai politics before any new election. Ordinary Red Shirts struggle for democracy, dignity and social justice, while Thaksin and his political allies wage a very different campaign to regain the political influence they enjoyed before the 2006 coup d'état. December 14, 2013 -- Links International Journal of Socialist Renewal -- The hypothesis that the present long-running unrest in Thailand is primarily caused by a “crisis of succession” assumes that the Thai monarch has real power and that he has been constantly intervening in politics. That is just not the case and the real cause of the crisis lies elsewhere. Thailand does not have an absolute monarch or North Korean-style despot in his twilight years, with factions fighting over who will be the next ruler. The Thai absolute monarchy was overthrown in the 1932 revolution, and since then, power has been shared and disputed among the military and civilian elites and the top businesspeople. For much of the time between 1932 and the mid-1980s, the elites ruled by dictatorship. But this has become harder and harder to do ever since the mass uprising against the military in 1973. 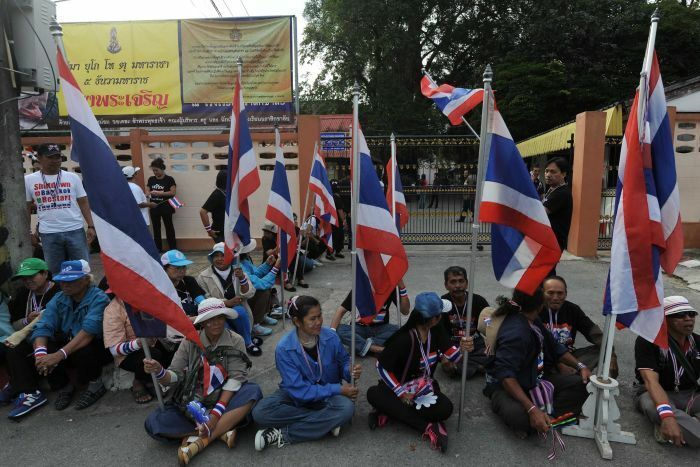 December 4, 2013 -- Links International Journal of Socialist Renewal -- A semblance of calm has returned to Bangkok as the royalist anti-democratic protesters were allowed to symbolically occupy Government House. They took pictures and then left. A temporary truce has occurred around the king’s birthday, December 5, since the royalists did not want to appear disrespectful to their “dear leader”. The government also wants to show its loyalty by staging the usual ceremonies in a calm atmosphere. Thaksin Shinawatra, after all, is a royalist too. But don’t be fooled. The aged king has no real power and he has never been brave enough to stick his neck out and do anything under his own initiative. He is the tool of the military and the elites. The real power is with the army. So what is the score so far in the battle between the royalist conservatives and the elected government? Thousands of crazed middle-class reactionary royalists, led by the notorious blood-stained Democrat Party, have been demonstrating in an attempt to get rid of the Yingluck Shinawatra government. November 24, 2013 -- Links International Journal of Socialist Renewal -- The disastrous and disgraceful amnesty bill, put forward by Yingluck Shinawatra’s Pheu Thai government in early November stirred up a hornet’s nest of “Yellow-Shirt” buzzing. Thousands of middle-class royalists, led by the notorious Democrat Party, have been demonstrating in an attempt to get rid of the government and all of Thaksin’s influence. They were very upset that the amnesty bill would have allowed Thaksin Shinawatra to return. These are the people who called for and supported the 2006 military coup against Thaksin’s democratically elected government. These are also the people who supported the bloody crackdown on Red Shirt protesters in 2010. Democrat Party strongman Sutep Tueksuban, addressing a crowd of supporters, called for the “restoration of full monarchy rule”. 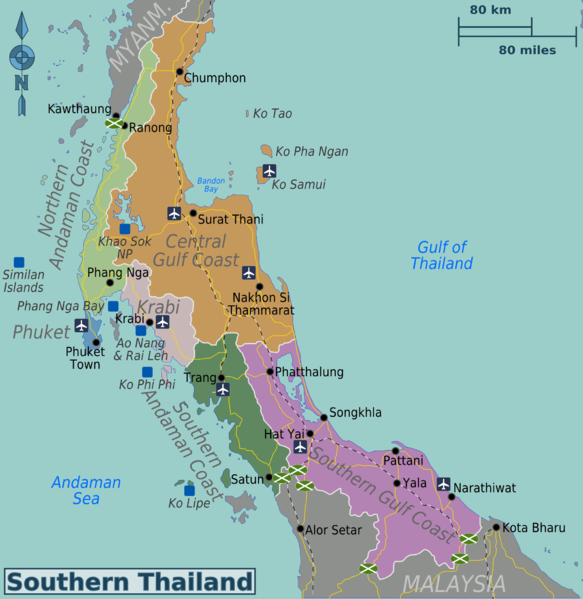 October 2013 – Links International Journal of Socialist Renewal -- This article is an attempt to analyse the political situation surrounding the bloody civil war in “Patani-Southern Thailand” from the perspective of those who seek freedom, justice and self-determination. Unlike most academic papers or books on the subject, this article is not aimed at top politicians, military generals or officials of foreign powers, all of whom seek to maintain their own class interests by stressing “stability” or measures to “contain” the situation without any regard to the wishes of ordinary people. Thailand's Prime Minister Yingluck Shinawatra reviews the troops. For more on Thailand and the Red Shirt movement, click HERE. June 17, 2013 -- Links International Journal of Socialist Renewal -- One might be tempted to celebrate the fact that Tarit Pengdit, head of the Department of Special Investigations, has forwarded the cases against former PM Abhisit Vejjajiva and his deputy Sutep Tuaksuban to the public prosecutor. Tarit stated that there was ample evidence that they had ordered the killings of Red Shirt pro-democracy demonstrators in 2010. April 21, 2013 -- Links International journal of Socialist Renewal -- As Thailand's Prime Minister Yingluck Shinawatra posed, smiling and holding hands with the butcher of Bahrain, Hamad bin Isa bin Salman Al Khalifa, Thai foreign minister Surapong Tovichakchaikul was acting out an extreme nationalist game with Cambodia over the Preah Vihear Temple. The Preah Vihear Temple was built by the Khmer, in Khmer style, when the Khmers ruled a large empire covering the area that is now Thailand, Cambodia and Laos. It belongs to Cambodia. Almost everything that the Thai ruling class claim to be “Thai” was copied from the Khmer, including royal language and so-called Thai-style architecture. Sukotai was a Khmer city with a Khmer king. Ayuttaya also had some Khmer kings. Therefore when the Yellow Shirt nationalists and the military demand that “Thai territory” be returned they are merely playing out an imbecilic myth. It is a myth to divert attention from the inequality, exploitation and repression within Thai society. November 24, 2012 -- Links International Journal of Socialist Renewal -- Karl Marx once wrote that “History repeats itself, first as tragedy, then as farce”. The tragedy was the 2006 military coup and the cold-blooded murder of unarmed Red Shirt protesters who were calling for democratic elections in 2010. The farce is the current protests by a motley collection of “dad’s army” generals, monarchist Yellow Shirt PAD [People'es Alliance for Democracy] supporters and other conservatives calling themselves Pitak Siam (Protect Thailand), whose declared aim is to "put Thai society into a deep freeze”. A mobilisation by Thailand's Red Shirt democracy movement in September 2010. September 9, 2012 -- Links international Journal of Socialist Renewal -- Six years after the September 19 coup d'état against the Thaksin Shinawatra government, it is possible to look back and assess the impact of the crisis on Thai politics and society. One way of understanding the “dialectical” relationship between Thaksin Shinawatra and the Red Shirts democracy movement is to borrow the concept of a “parallel war” from Donny Gluckstein's book on the Second World War. According to Gluckstein there were two parallel wars against the Axis powers. One was an imperialist war, waged by the ruling classes of Britain, the United States and Russia for their own interests, while the other war was a people's war against fascism, waged by ordinary working people, many of them socialists.